In past stories Five ways to hurt your (L)EGO and What can I re-use for the train? I mentioned the brittleness of old 1980s LEGO Trains sleeper plates. Looks like there are many bad ways to dismount them, and really, only one good way. Doing this the wrong way I managed to hurt more than one sleeper plate, but doing it right my plates have stayed intact. 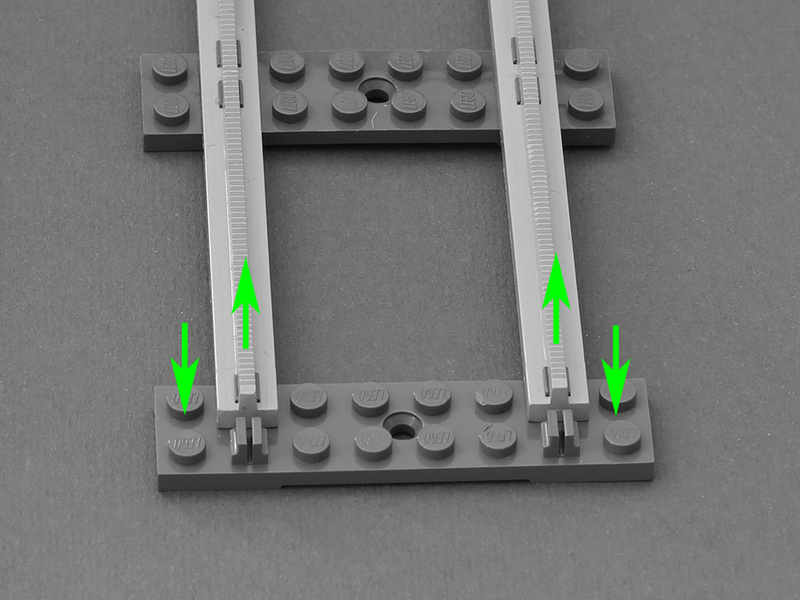 The clips are especially at a risk if the attached tracks are twisted sideways. The middle of the sleeper plate seems to be most at risk if the plate is bent, which can happen when trying to disconnect the tracks from the clips and (quite naturally) pressing the middle of the sleeper plate downwards. Don’t twist or bend towards the sides, only straight up. Also, don’t pull too hard or too high either, so that other sleeper plates possibly still connected to the track won’t break. Notes on 12V powered tracks (not pictured): Lifting the power inserts is easier, as they connect to studs instead of clips, but make sure not to bend the sleeper plates when removing power inserts and always hold the sleeper down from the ends. Usually you need to remove or lift the power inserts before you can connect/disconnect tracks/sleepers. Make sure the sleeper plates or track clips aren’t bent while juggling the power inserts. The power inserts themselves look like they can take a beating, as do the tracks, so most care should be directed at the more fragile sleeper plates. Well, that’s my experience anyway. Your mileage may vary. If you have any other suggestions, comments are welcome.